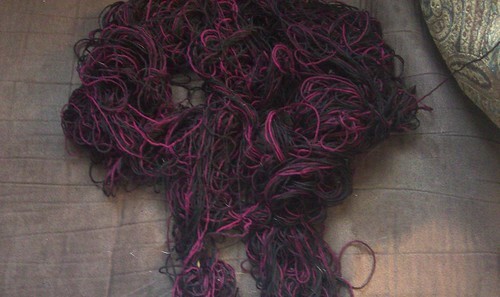 Or should I say puppies and half used skeins of Wollemise? It's probably more than half. I'm using it to make a pair of Rick socks by Cookie A for a good friend of mine. Her patterns are brilliant. Anywho, this is what I found when I got out of the shower this morning. It was all over the living room, I've gathered it together for this shot. 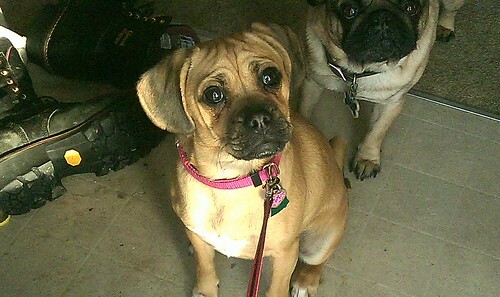 You can see Bert in the background clearly saying "It wasn't me, Mom. It was all her. Honest!" I'm thinking it was all Dehlia, maybe a bit of Bert since I could hear them wrestling around. Must be because spring's in the air.